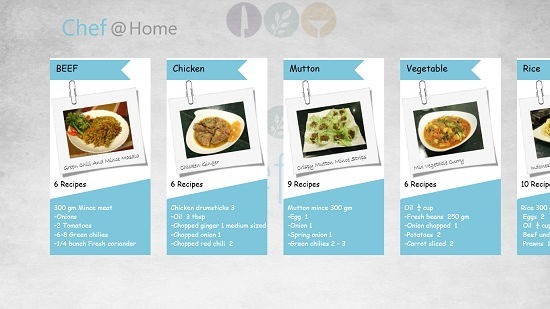 Chef@Home is a free cooking app for Windows 8 and 8.1. The app is uncluttered, organized and minimalistic with recipes sorted according to the type of main ingredient used. When I opened the app, I was shown a pretty background on which the recipes appeared once the loading of the app was complete. The loading took about 3 seconds, although I didn’t clock the loading time. Once opened up, I was able to choose the category of the recipe, and then immediately was shown the recipes towards the pane on the left, and the main recipe instructions were shown on the right side according to the recipe which I clicked on in the left pane. Chef@Home is a free app which can be downloaded from the App Store from the link at the end of this article. When I launched the app, I was shown a tiled interface layout which looked pretty much like the below screenshot. So the above interface brings to light what I talked about in the introduction to this review. As you can see, the various categories are made according to the prime ingredient, and the categories include, Beef, Chicken, Mutton, etc. Opening the recipes are as easy as clicking on a category, and you will be shown the various recipes that you can cook at home to tantalize your taste buds. You can see the approximate number of recipes in each category in the category preview, and you can see the below interface upon clicking on a category. 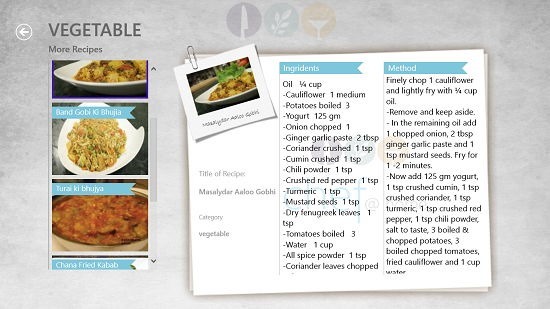 Now if you take a close look to the screen shown above, you can see that your recipes are presented to you on the left, and the instructions become available on the right side of the screen when you click on a particular recipe towards the left. Hovering on the instructions screen will present you with scroll bars which can be used to read the instructions, scroll etc. The back arrow button is, like always, present conveniently at the top left corner of the screen enabling easy access to go back to the previous screens. 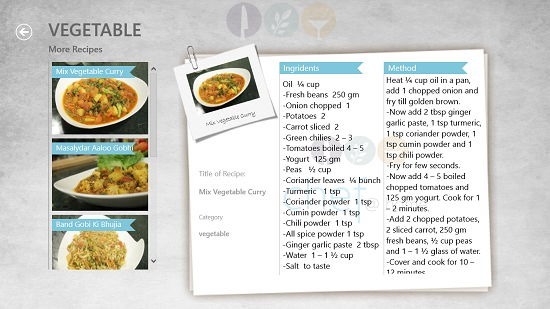 Below is a screenshot of another recipe in the app. Now I could go on and write a lengthy review about how I love the app for its design, implementation, et al. but I’ll just leave it here for now, as this basically wraps the main features and almost everything that the app offers. I absolutely love the app, and there is no doubt about it! Chef@Home is a well designed, nicely implemented cooking app which makes for a great download if all you want to do is to learn some amazing recipes to cook easily at home and amaze your family and friends. The picture accompanied recipes will get your mouth watering just by looking at them, and I’m sure you’re going to love the app, the same as me! I would definitely rate it a 5 out of 5!